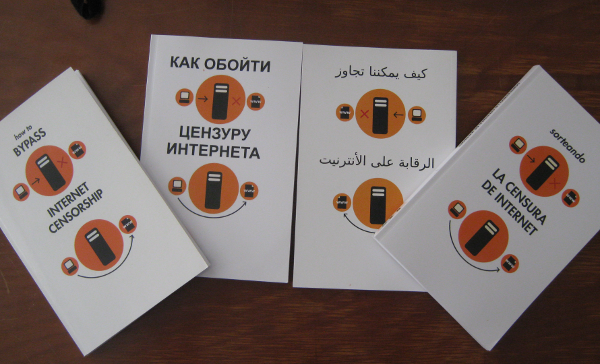 For some months, Booki has been able to import Archive.org books. This development was sponsored by Archive.org. When importing a book, Booki requests an ePub from Archive.org, converts this to the ‘native file format’ (booki-zip) and loads this into the Booki database. It is then possible to export the same book back into an ePub file. So, if Booki can import an Archive.org ePub and then export it as ePub what is the point? Seems like Booki is an unnecessary conduit. 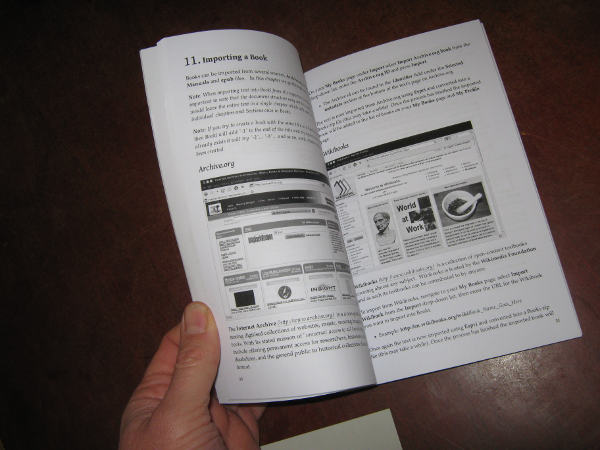 Well, one point is that with Booki you can export the book into multiple formats – such as book-formatted PDF. That means you can take any of those luscious out-of-copyright books, import them into Booki and make real books from them. This is pretty exciting when you see just how lovely some of these books are. Take for example the copy of Cinderella in the American Libraries section of Archive.org. 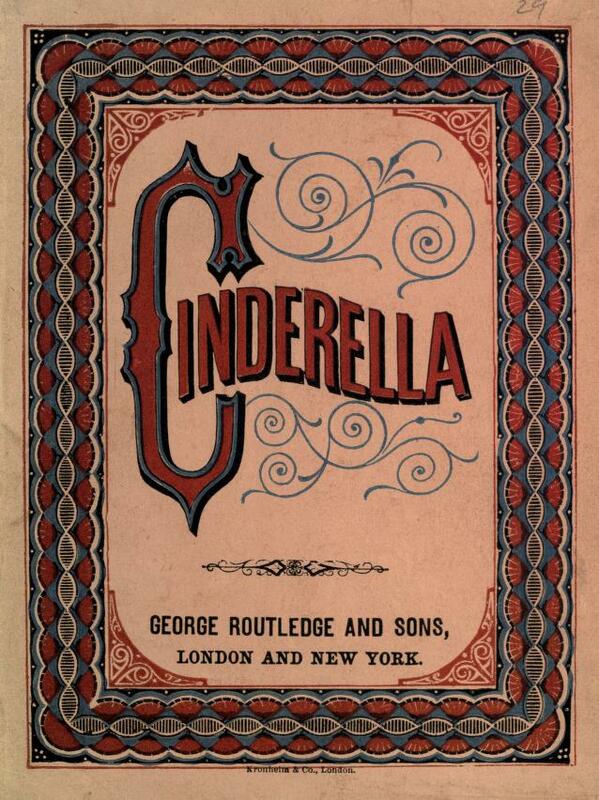 This version of Cinderella is out-of-copyright and you can republish as you like. This is a pretty exciting prospect, opening the door for anyone to start their own publishing house importing content from Booki, styling, and exporting to print-formatted-PDF for printing. However, there are a few steps that you may need to go through first, and this is the real reason why we have implemented importing from Archive.org. All the books in the Archive.org libraries have been created using OCR (Optical Character Recognition) scanning. 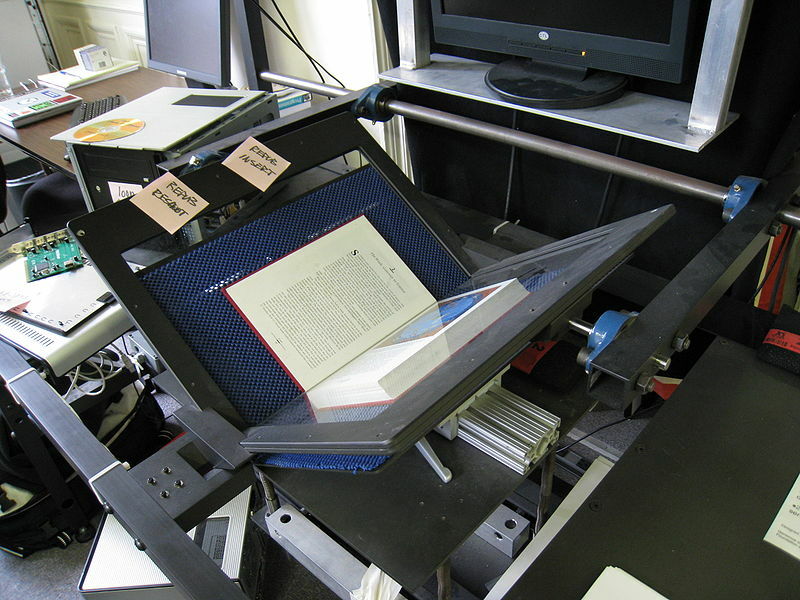 The process involves loading books onto book scanners and scanning each page. However, scanning creates a certain amount of errors. OCR doesn’t render all text correctly and cannot tell the difference between text on a page and text in an image. Hence images with embedded text are usually split up, with the text elements saved as plain text and the surrounding image saved as multiple smaller images. So the OCR-scanned books need proofing and the import feature in Booki enables proofing of OCR scanned books from Archive.org. This means that teams can get together remotely, choose a selection of Archive.org books, and get to work improving them. While this is all working, we want to build a tighter workflow and a few extra tools to assist the proofing process (if you are a developer familiar with Python and interested in helping us with this good cause then let us know). Douglas Bagnall (Booki/Objavi developer) recently extended the import functionality so that all the metadata imported from Archive.org is preserved. This opens the door to utilising this information to assist proofing of the content – we hope, for example, to eventually be able to show the complete digital image of the original scan, before it was reduced to OCR, alongside the OCR pages to assist proofing. Watch this space! Incidentally, Booki can import any ePub, so this means that the way is open for the same proofing process to be applied to other OCR scanning projects. If you have a project like this then let us know, maybe we can help. My role as ‘an educator’ revolves around group processes – namely, Book Sprints. Essentially I facilitate groups of 5-10 people working together in one room over an intensive 3-5 days to produce a book. Zero to book in 5 days (or less). This process is known as a Book Sprint and although it is an uncommon practice, most people who ask for and participate in a Sprint see it as a Book Production methodology. However, I would argue that, in all circumstances, the collaborators walk away having learned a great deal about the subject they have just created a book about. I also believe that this process can be used by students to write their own textbooks, learning what they write and passing the free textbook onto the next year’s students to improve. I am eagerly awaiting the first enlightened institution that would take this on, and I am sure they would be positively surprised by the results – both in the quality of books produced and by what the students learn in terms of content and collaboration. Book Sprints utilise collaborative environments. The only Book Sprint (1) I know of before we did them (2) used word processing documents – passing these around via email between collaborators – and a wiki for collecting the articles. Part way through the process, they gathered in person to develop the outline in a one week intensive ‘Outline Sprint’ and then proceeded to collaborate via email and a wiki over a period of 4-6 months. After the material was complete, the group passed the documents through several editing stages. The process cut the standard industry timeline down by about 30-50%. Zero to book in 4-6 months is still pretty good in the publishing industry. However, for FLOSS Manuals, 4-6 months was too long. We wanted to do it in 5 days and so we needed a quicker methodology and a better tool set. Wikis might come to your mind immediately as they did to us. However, we had already realised that wikis were not built with the right paradigm. Books are very structured and wikis are not. That is the essence of it – I don’t want to get into ‘future of the book’ discussions. 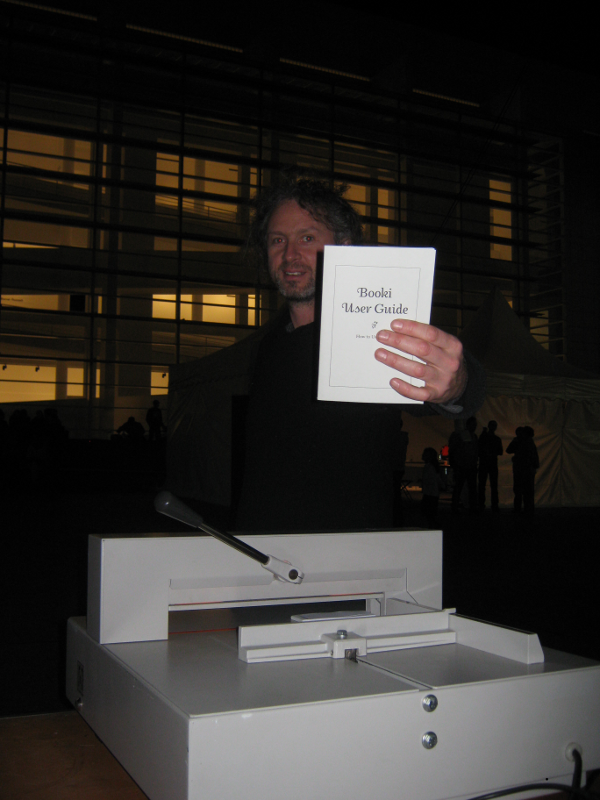 Books can be many things, so I am talking here about what ‘most’ people mean by a book. A one piece cover, several hundred pages, table of contents, structured readable and comprehensive content, self-contained with very few references to other parts of the document, and careful use of outside references instead of a welter of back-and-forth hyperlinks. 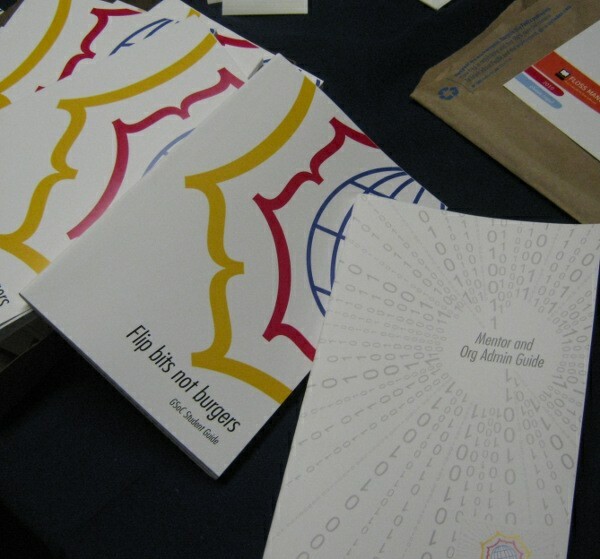 We built a system that could produce this kind of book – paper books – in a Book Sprint environment. Zero to book in 5 days – that leaves about 3 minutes at the end to produce book-formatted PDF ready to upload to a PoD service or send to the local printer. That is what we needed, and wikis don’t enable you to do that. So we hand rolled our own. The first generation was built on TWiki and we pushed it to its outer limits with extensions built by Aleksandar Erkalovic and a PDF renderer built by Luka Frelih. 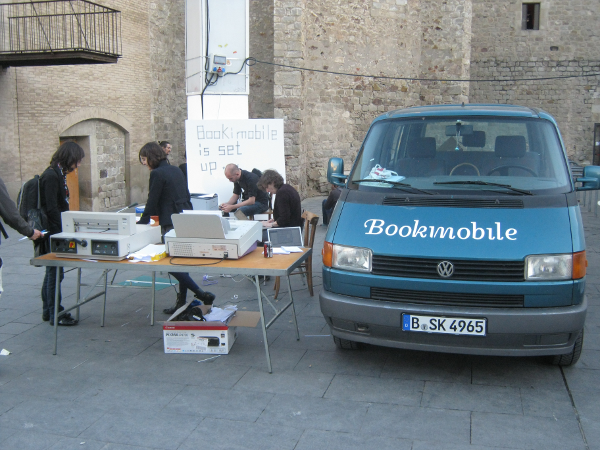 Now we are onto the second generation – Booki (a BOOK-wikI if you will). It does the same job as the first tool set, but does it better – it’s easier to use, more flexible, and it supports a greater number of possible output formats and types. While Booki does a lot, and it’s hard to imagine a Book Sprint without it, there are limits to working digitally in a Book Sprint. Certainly, we also experience the highs of surprising networked collaboration. One Sprint (‘Introduction to the Command Line’) was written almost entirely remotely and written in 2 days (Mako Hill, FSF Board member and renowned hacker said it was the best book on its topic). 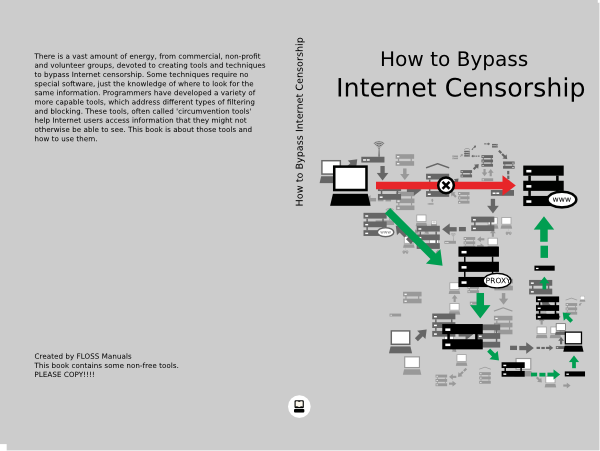 However, there are also limits to digital media and digital networks. I believe that there is less knowledge passed through digital media communication channels when collaborating. I firmly believe this – other wise we would have all of our Book Sprints remote – it would cut down on logistics and costs. However text-based chat does not convey enough information, VOIP is terrible for more than 2 people at a time and even then I wonder at its real usefulness in intensive collaboration, and email is just too slow and the ‘unthreaded’ nature of email will soon drive you crazy in this kind of environment. Microblogging is as good as IRC in this instance – ie. barely useful. Sneaker networks are not only faster but more fluid and they enable better-shared understandings, quicker. In addition, I find it is often good to push people out of the screen and into the book. Since we work fast in Sprints we sometimes realise we need to clean up structural issues. This often occurs when 2 or more people are working on content that needs to fit together – and it doesn’t. 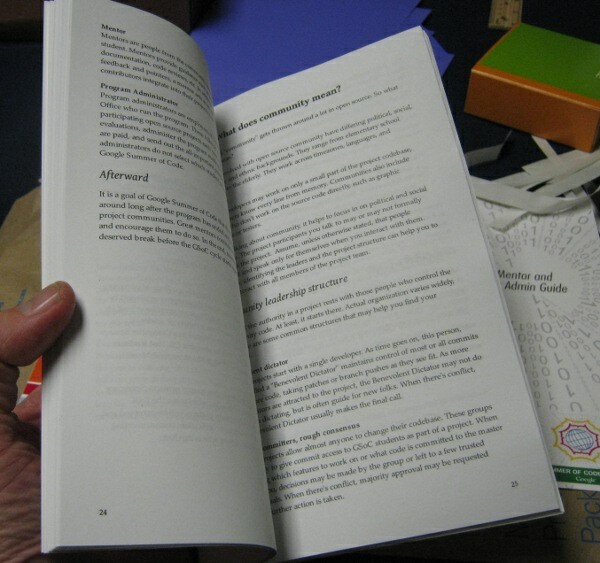 Often we print out the necessary chapters, sit on the floor, and (gasp) cut-and-paste the chapters into each other until they work. Same process as a digital text editor, just with a physical tool set – the result is that it gets better results quicker. The end result of a Book Sprint is a book. That’s a great thing to have. However there is also a mandate to take care of, and content to take care of. How do you enable this content to live? Books do not live by licenses alone – they need help. They need the original collaborators to find the avenues to keep the content alive. One strategy is to maintain this content themselves although, despite good will, this seldom continues beyond some initial edits immediately after the Sprint ends. The original collaborators need to pass on the mandate to others and this is critical for the life of the book. As such I discourage the use of terms like ‘authors’ as this denotes legacies of ownership and does not encourage new contributors to take the mandate to improve the book. Instead, the strategies revolve around keeping the participation threshold low (minimising social filters, using open language, making Booki simpler and simpler to use) and welcoming in new contributions. We also welcome forking books. Take a book – make it your own whichever way you feel is best. (2) Marco Zennaro, Enrique Canessa, Carlo Fonda, Martin Belcher, Rob Flickenger, “Book Sprint” in The International Journal of the Book (Melbourne, Australia, Common Ground Publishing, 2006) Vol 2 Number 4.
written by Adam Hyde, founder of FLOSS Manuals.